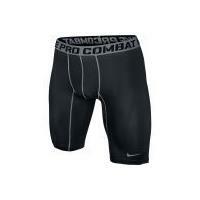 Pro Combat 9'' Compression Dri.. Compression shorts with seamed fly, 9 inch inseam Dri-FIT properties keep you cool and dry Mesh panels offers ventilation and moisture wicking Strategically designed seams provide enhanced comfort Lightweight, stretch polyester Nike apparel is dedicated to the lifestyle of an athlete. The Nike Dri-FIT collection of shorts and t-shirts is designed to wick sweat away and keep you dry and comfortable during all of your athletic endeavors. s="h3color tiny">This review is from: Nike Men's Pro Long Compre.. Although I do love Nike brand for its obvious appeal and style...even considering some of the less desirable outsourcing traits the company has I still continue to buy their products because I like them. I do have to say I am disappointed with the overall fit and quality of this product though. I order medium whenever I get compression shorts... I have 4 Under Armour ones and this Nike one. I have 0 complaints about the UA products however I received the Nike last ..
Much thinner fabric, seem shorter and cheaper quality compared to earlier versions of these...for some reason they seem to have lessened the quality.